32 School words on a large poster. These posters makes teaching School vocabulary easier. The numbers on the poster lend to fun activities. 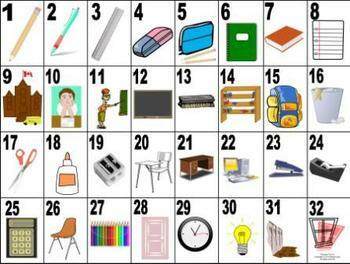 This package contains materials to make two school teaching posters, a student copy of the vocabulary list and activities to do when teaching the vocabulary. If you have storage issues you could trim and laminate each sheet and use magnets, stick tack or tape to attach them as a poster to the board while teaching the vocabulary. When assembled the Picture Vocabulary poster is approximately 21”x24” and the coordinating Word poster is about 16x20. Other coordinating materials for working with School vocabulary are available in my store.